Did you know the U.S. Food and Drug Administration (FDA) does not have authority to review dietary supplement products for safety and effectiveness before they are marketed? Sounds unreal but as I started researching supplements, that one of the few facts I uncovered. What this means is that it is up to the manufacturer of these supplements to be trusted for the quality and safety of their products. Now, there is an FDA law that requires companies to prepare their products according to GMP or cGMP guidelines (good manufacturing practices or current good manufacturing practices, see below), and these are a series of general principles that must be observed during manufacturing. However, it is the company’s responsibility to determine the most effective and efficient quality process. So, we all know how this goes; if one can cut corners and save money, you can bet it will happen. Companies have been caught putting the wrong ingredient in their products, not meeting label claims, using materials with high levels of heavy metals or unhealthy ingredients. What is a consumer to do to have trust in a product they are putting in their body? The answer is reviewing the company’s ownership, website or other information about their manufacturing process and if the information does not contain the following points, move on and find another company. Let’s start with the first biggie: Who owns the supplement company. I have found that independently owned supplement companies are a safer bet. This is how they typically start off: They gain the trust, credibility and medical attention by running clinical trials and then proving themselves with highly regarded medical practitioners who see the results with their patients. This can however change. It’s the industry standard for large companies to enquire smaller companies. Like, for example, at the time of writing this article, Nestle has just bought over some of my favorite supplement companies: Pure Encapsulations, Douglas Labs, and Garden of Life. The fact is that public listed companies like Nestle have a much higher responsibility to their shareholders in growing their wealth than to you in taking clean and highly effective supplements. If they can cut corners, they will. Because you may not know that over the next 12 to 24 months, the formula will begin to change; to save money, increase profits and increase shelf live. I’ve personally seen the same happen when I used to work for an advertising company and L’Oreal was our client; after they bought Body Shop and Kiehl’s, these products don’t look anything like what you, the consumer originally fell in love with. They got bastardized with the endocrine disrupting BPA, aluminum, phthalates (includes fake fragrances) and colorants that are a far departure from what they stood for. The problem is: these mergers and take-overs happen quietly (typically only published in financial papers), so as a consumer you won’t even know about it. The product label, website, Amazon link, and price may remain the same – and over time, the ingredients will be quietly replaced. But you have not been looking at the ingredient list because you trust the brand, so why would you. Until you do and your jaw drops. This is not good news as I personally don’t trust Nestle. You might remember the deceiving baby milk formula campaign they launched in Africa that caused thousands of babies to die of depletion or starvation. The evil scoop is: Nestle would give out free milk formula samples (offered by sales reps dressed as nurses), and tell the women that baby formula is richer than mother’s milk. The young, uneducated mother, inspired to be “progressive” would stop breastfeeding effectively stopping her own milk production. So now she would have to… buy the formula. When the average income in these poor countries is $1/day, the $7/week formula cost is too high. To cope, the mother would then diluting the milk (often with contaminated water); depleting the child who would then die of malnutrition or starvation. And so now this is the same company that is the owner of some of the darling supplement brands like Pure Encapsulations, Douglas Labs and Garden of Life. What you can do: find out who currently owns the company and often monitor the supplement ingredients. One of the most important certifications a company can have is one that ensures third-party testing for good manufacturing practices. This way the company is being checked by someone, other than themselves. Any company can say they follow or are using GMPs, meaning they have implemented checks and balances for themselves based on the requirements of the FDA. Again, some companies may be following this closely while others may take liberties. A few organizations do offer a third party GMP certification, like NSF and USP, and this would be something to look for to ensure safety and quality. NSF Certification to NSF/ANSI 173 – This American National Standard helps confirm that what’s on the label is in the product and that the product contains no unsafe levels of contaminants such as heavy metals, pesticides, and herbicides. Products certified to this standard bear the traditional NSF mark. GMP Registration – it doesn’t apply to individual products but rather confirms that a manufacturer’s production facility is observing good manufacturing practices established for their industry. GMP is a series of guidelines that address aspects of production and testing that can impact the quality of a product, such as a record keeping, personnel qualifications, sanitation and cleanliness, and equipment maintenance. Although no testing is performed by the auditor on samples of individual products during a GMP audit, such testing is available under NSF/ANSI 173. These two levels of inspection and testing should make a consumer feel secure in the products they are purchasing and a company having both of these from NSF is even better. The more transparent a company is about their practices, the easier the choice becomes as to what supplement line to buy. You should also look for a company that has full traceability and uses all non-GMO ingredients for all their products. Another common label claim that should be noted is how “free of” ingredients the line is when it comes to allergens and fillers. Given the number of people who need allergen friendly products, look to see if the product free from all the main allergens such as gluten, dairy, soy, corn, peanuts, yeast, or other ingredients for which you may have an intolerance. Another element class to avoid is artificial sweeteners, colors, additives and preservatives. When taking supplements to improve health, you don’t want ingredients in them that will create inflammation or damage cells. What you can do: Pick supplements that are free of gluten and GMOs. If intolerant or allergic, also avoid supplement containing soy, corn, peanuts, and yeast. Buying inexpensive supplements comes with the high price of inexpensive binders. These low-cost binders, such as magnesium oxide or zinc oxide, can dramatically reduce bioavailability and absorption of supplements (sometimes causing GI distress). Spending the extra money to buy supplements with better binders is worth it so you actually can receive the benefits from taking it. What you can do: Choose “clean” products that have the nutrients in them you need to take and have little to no fillers. Be sure to look at the list of other ingredients on the label. Quality products will use other ingredients that improve absorption or work synergistically with the nutrients and are not just there to fill the capsule or bottle. If a supplement from a reputable brand costs $30 and you just found a knock-off for $12, this should raise a red flag rather than create excitement. It’s most likely that the supplement is either made with inferior ingredients or it’s a fake (even if the label shows the reputable company logo). What you can do: Do your research what the range for a good supplement should be and stay in that range. Vitamin E – Vitamin E can be a concern because many times it is derived from soy oil or wheat germ oil. Although these oils may be highly refined and will not contain any parts of the protein from soy or wheat germ, there is a chance they might. The label should state if wheat or soy are used in the product – so remember to look closely at the label. Solvents – Chemicals solvents like hexane are used to extract fatty substances from plants, seeds and soy and other fats. Hexane is a neurotoxin and ingesting any residuals left from the processing of your supplement is not suggested. Be sure you know how the herbs, lecithin, evening primrose, etc. are being processed from the company you purchase your products. Look for supercritical extraction as the process used to make the products. Titanium Dioxide – Widely used as a colorant in supplements, and throughout the cosmetic industry, titanium dioxide has recently been classified by the International Agency for Research on Cancer (IARC) as an IARC Group 2B carcinogen ”possibly carcinogen to humans”. It is best to avoid products that have this ingredient. Fish Oils – When purchasing fish oils, you must be sure the product is molecularly distilled and filtered to ensure purity and to maximize the removal of heavy metals, pesticides, solvents, PCBs, and other contaminants. Study have shown fish to have high concentrations of these toxic ingredients and ensuring that the company you buy your fish oil from is removing these is important. Methylated B12 and B6- MTHFR enzyme converts inactive folate to the active form your body can use. Without this conversion, the body is unable to break down homocysteine efficiently and high levels of homocysteine cause inflammation in the body leading to many health conditions. Some of the conditions linked to elevated homocysteine are cardiovascular disease, stroke, miscarriage, migraines, depression and other mental disorders. B vitamins in a methylated form is a great choice for those with an MTHFR defect in their genes – which is over 30% of the population. Reputable supplement companies cater to that and offer vitamin B12 in the methylcobalamin form and B6 in a pyridoxal-5-phosphate form. In this form, they can help to lower homocysteine levels. Folate (not folic acid) – Reputable supplement companies do not use folic acid but folate and the best form is in its methylated form, 5-methyltetrahydrofolate. Magnesium – If the supplement company offers magnesium in oxide form, it’s a dead giveaway that it offers the cheapest and least bioavailable form of magnesium. Reputable supplement companies will offer magnesium in the form of citrate, glycinate (my recommendation) or malate. I didn’t believe in supplements for a very long time. I had a skewed view that the right food is the answer to everything. This is until I hit a wall with my own health and realized that supplements have their place. Do I take supplements now? Yes, along with a nutrient-dense diet. And same as you, I’ve been diligent about buying good quality supplements that heal and not harm. But, it’s not always easy and straightforward. I ended up creating my own line of supplements – Hormone Balance Nutritionals – that comply with all the 6 RULES I wrote about. Rule #1: Ownership – they are made by small and highly reputable supplement and material suppliers. Rule #2: Certifications – they are NSF and GMP compliant. Rule #3: Free Of – they are free of gluten, dairy, soy, corn, peanuts, artificial sweeteners, additives, preservatives and are made with non-GMO ingredients. Rule #4: Binder and fillers – they are free of any binders and fillers. Rule #5: Price – they are not the cheapest in the market because they are made with quality ingredients which is what will help you heal. 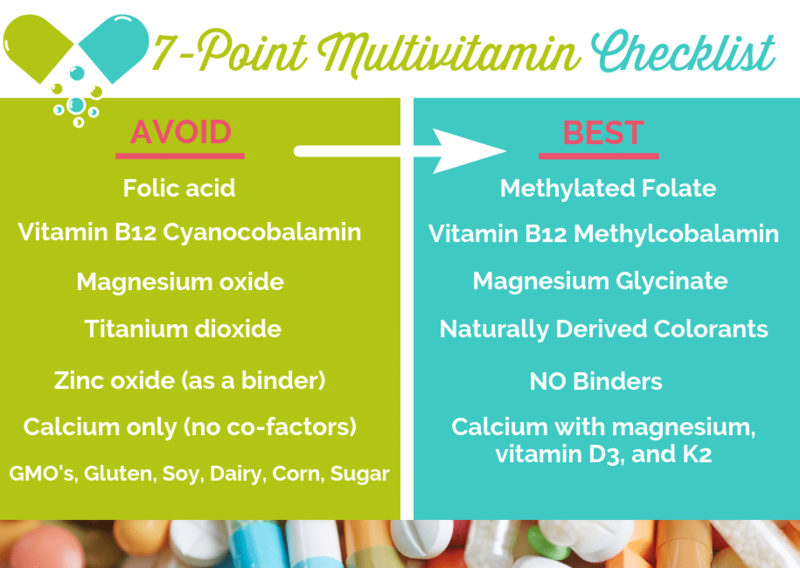 Rule #6: Other Factors – Hormone Balance Nutritionals only use a methylated form of vitamin Bs such as methylcobalamin (B12), pyridoxal-5-phosphate (B6) and 5-methyltetrahydrofolate (folate or B9). Our magnesium is in the glycinate form. Our fish oil has been molecularly distilled and filtered and externally tested for purity. Check out the store – there are plenty to choose from. We offer single products such as Magnesium Replenish, B Maximus, Essential Omegas (containing both EPA and DHA), liquid D3 Maximus (also containing vitamins K1 and K2), DIM and many more. I’m so happy and proud of our store! I hope you can support Hormone Balance Nutritionals – so it can support your journey to wellbeing as well. You mentioned it at the beginning of your video. Thank you for the extremely helpful article and video! My family and I currently take Garden of Life and Pure Encapsulation. I learned through my functional pharmacist’s NutriSearch guide that Garden of Life is rated pretty low so we were already going to look at other options for multivitamins. But these sell-outs have given me another reason to look elsewhere. On another note can your supplements be used by men and children (11-year-old girl & 14-year-old boy)? Yes, I wonder too what is your perspective on Shaklee products? Susan pure encapsulations have been bought by Nestle last year. It used to be a great company but as it ussually happens when someone like Nestle buys out an established complany they start to alter the purity and the ingredients and change the formulas . It happened with lot of other companies that i used to love. Since Nestle cares about profits it shows in what they produce.